With the start of the swimming season in early July, a Shinto ritual is held at the beach to pray for marine safety. There are 3 swimming areas in Kamakura. In recent years, Yuigahama Beach has become popular for its famous restaurants, and beach houses that have been designed in collaboration with fashion brands. It has become a swimming area that even adults can enjoy. At Zaimokusa Beach, Japan’s oldest man-made island that was built in the Kamakura Era, Wagae Island, still exists alongside. Up until the Edo Era, it had been used as a port. Designated as a National Historic Site, what little remains on the island can be checked in whole during low tide. At Koshigoe Shore, there is a barbeque and beer garden that has an all-you-can-drink option for 150 minutes only during the summer. In the daytime, it’s a beach house while at night, it’s a bar so you can enjoy the whole day there. Kamakura, accessible by train from Tokyo Station in 50 minutes, has been hailed by the media as the No. 1 date spot. You can take a stroll around the Kamakura area and then view the sunset by the beach so that in 1 day you will have been able to take a look at the sea, mountains and the city. You can enjoy swimming and marine sports at Inamuragasaki. The cape that juts out from the coast is a park that has been chosen as a place of beauty in lists such as “The Top 100 Historical Parks in Japan”, “The Top 100 Views of Mt. Fuji in the Kanto Region”, and “The Top 50 Picturesque Sceneries in Kanagawa Prefecture”. Mt. Fuji can be seen during good weather and it is the perfect photo spot. Also known as a beautiful place for sunsets, it has become popular with many people at that time. The sole natural hot spring in Kamakura, Inamuragasaki Onsen, is limited to adults over 18. In 2004, the hot spring was discovered by chance, and as a relatively new onsen facility, it is not that well known. For the sand bath, a natural hot spring flows underground toward the shore and the sand there is heated to be utilized for the bath. Ibusuki’s sand bath panacea has been in use for about 300 years, and its effects have been said to be 3-4 times that of a regular onsen, promoting blood circulation and eliminating waste products and inflammatory materials. Also Ibusuki’s salt springs have the effects of suppressing inflammation and elevating skin renewal. Receive your yukata and towel for the sand bath at the entrance, change into the yukata in the men’s or women’s change rooms, and enter the outdoor sand baths without forgetting to bring your small towel along with your camera or smartphone. At Saraku, there are 2 sand bath areas which you can choose from: the all-weather semi-outdoor facility with a roof and the beach where the waves lap onto the shore. Once you wrap the towel around your head, lie on the warm sand so that the staffer can pour the sand onto you with a shovel. Your body will gradually warm up inside the sand so that you can enjoy a natural sauna. It’s recommended that you lie in the sand for about 10 minutes since a prolonged time might make you ill. Place your camera or smartphone nearby beforehand since a staffer will offer to take a picture of you while you are in the sand. After enjoying the sand bath, you can enjoy a leisurely soak at the indoor hot spring facility within the ancient waters of the deep underground area known as the “fossil seawater” that make up the fountainhead for the salt springs. Please take note that weeknights and weekends are crowded and that the baths cannot be entered during high tide. Since there are many pickup buses from the Ibusuki ryokan, it’s good to check at your accommodations. The coast of Shirarahama Beach in Shirahama Town, Wakayama Prefecture cuts an arc through the area which measures 640 meters in length. The pure white sand is mainly quartz which will fall through your hands like powder. The beautiful beach that is easy on the feet and the emerald green clear ocean make for something out of the South Seas. What is also attractive is the ability to walk barefoot safely from the beach into the water easily. The summer is alive with sea bathers and a rainbow of parasols increasingly brings out the South Seas feeling. Colorful fish just like the ones from the tropics can be seen and there are plenty of divers so that it is a popular area as one of the loveliest ocean spots in Japan. Also, the area is great during sunset. The sight of the deep red setting sun sinking into the horizon soothes the soul. Marine activities can be enjoyed from May to September, and it is the popular season for people to fill up the beach. However, there are onsen at Shirarahama Beach that can be especially enjoyed in the winter. You can enjoy yourselves at the hot springs of Shirara-yu which has that nostalgic air of a neighborhood public bath from the old days, and Shirasuna which can be entered in bathing suits while viewing Shirarahama Beach. The onsen can also be enjoyed during the summer when you want to warm up after getting chilled from all of the ocean activity, and they are the perfect places to relax after a stroll along the shore. How about spending a luxurious time in a hot spring while looking for that lovely view on the beach? There are various events at Shirarahama Beach. It’s not just swimming that can be enjoyed when you have events such as the Sand Festival Competition, the Nanki Shirahama Message Fireworks, the Shirahama Fireworks Festival, and the Candle Illumination where candles are placed in the sand. Not just limited to the summer, this is a beach that is alive with events such as fireworks and illumination all throughout the year. 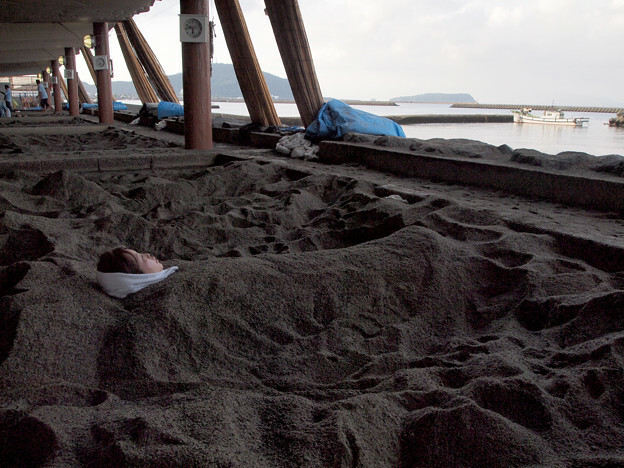 Located in a part of Shoningahama, one of the few natural sand beaches left in Beppu, this is a sand bath where you warm your body buried in sand that makes use of the geothermal heat of a hot spring. First opened in 1986, there is a movable roof so that the bath can be used even on rainy days, and change rooms, showers and indoor bathing facilities are also provided. In Kyushu, the sand baths of Ibusuki, Kagoshima are also famous, but due to the time needed to reach the place at the southern tip of Kyushu, the easily accessible sand baths in the heart of Beppu are also a hit with tourists. Only 12 people at a time can enter so there are often cases in which there are waits of over one hour, but if you have time, the staff can contact you by cellphone so you can wait and relax while strolling along the sea or enjoying the nearby foot bath. Warmed by a salt spring, the bath is great for chills, exhaustion, muscle & joint pain, and cuts & bruises. The sand is kept at a temperature of 42 degrees C and bathing for just 10 minutes will bring a feeling of refreshment and a good sweat. After receiving a yukata from the reception desk, a staffer will shovel the sand over you. The ocean will spread out in front of your eyes and you will be able to relax while hearing the sound of waves. If carrying a digital camera or a cellphone, don’t forget to bring it with you since staff will be willing to take a picture of you. Once you get out of the sand bath, your body will cool down quickly from the sweat, so getting into a shower to completely wash off the sand and then heading into a bath is the rule. Shampoo, body soap and a dryer are supplied, and towels can be rented for a fee. This is a place which you can visit easily without needing to carry anything. The Tottori Sand Dunes are a nature spot that represents Tottori Prefecture. Nationally designated as a Natural Monument, the sand dunes which were selected as one of Japan’s Top 100 Geological Features boast an east-west width of 16km and a distance that spans 2.4km from north to south. You could imagine it as a flat sand field but it is unexpectedly rugged. The slightly elevated hill known as The Horse’s Back which can be seen at the front has a height of 40m. The contrast of the white sand seen from the peak and the blue ocean is wonderful and it’s well worth the climb. The ponds known as suribachi are also a special part of the dunes. There were once over 30 of these ponds in the past but currently there are only 10. The largest suribachi is Origo Suribachi and it appears as a volcanic crater with a depth of 40m. Standing on the sparsely populated dunes in the wind-swept early morning, you will find ripple-like patterns known as fuumon. It makes for valuable scenery that couldn’t be viewed unless various conditions were met. There are nothing but activities with a difference on the sand dunes. There is not only camel sightseeing that is rare even in Japan but also walking around the area. First-timers are also welcome to try paragliding. You can enjoy as many things as you like without coming across any obstacles of wood or stone on the dunes. Sandboarding, which is popular worldwide, is a sport where you can slide down the sand just like snowboarding. You can enjoy it in many ways whether you are a beginner or an advanced participant. Sand yoga is something that can only be done here. The power of land, sky and sea can be felt with the whole body whether you are basking in the morning sun, viewing the sunset or just being under the starry sky and full moon. He is thoughtful person to be with. Thanks a lot.